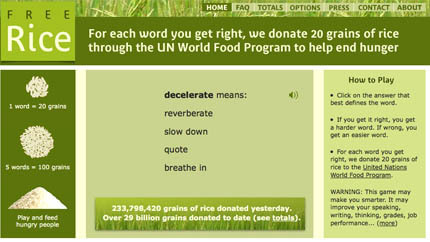 The Free Rice website blends two excellent things: using advertising money to donate rice via the UN World Food Program - which is a GOOD THING - and a word definition game. As it says, for each word you get right, they donate 20 grains. They could just say "endlessly refresh the page" as each click could donate, but they make it interesting, rewarding and cumulative, which is far more effective at driving endless clicking. Build your vocabulary and harnass the awesome power of intertising to make rice appear from nowhere now. Spotted at a restaurant in New York's trendy SoHo. 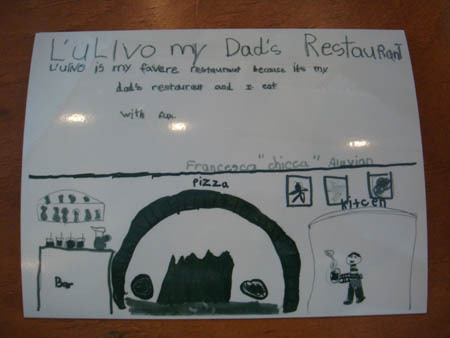 What better way to say this is a family restaurant than to get your daughter to design the back of the menu - love it. My mate Mimi just sent me this piece of Friday fun. I sometimes think it might actually be too easy to satirise the advertising industry. Facebook just launched instant messaging, which quickly reminded me how addictive IM can be, and got me thinking about different modes of communication. Instinctively, I believed that I used different kinds of communication for different, well, different kinds of communication. Modality and messaging dictated what you use. Somethings are better asynchronous [SMS, email], some better synchronous [face to face, phone call, IM], some are better audio, some better textual, some better as pictures [Flickr, postcards] some are better online [links] some off, some private, some public [Facebook Wall] some one to one, some one to many, some broadcast [like this]. But I'm not entirely sure that's the only way it works. 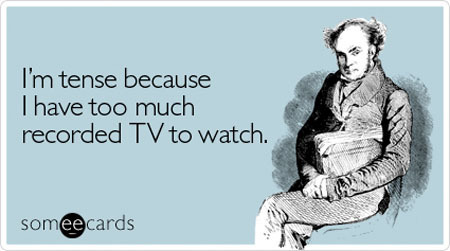 I've noticed that some people only use certain channels. I text my dad, email my mum. Younger friends [say below 25] never really seem to email, they just use Facebook. 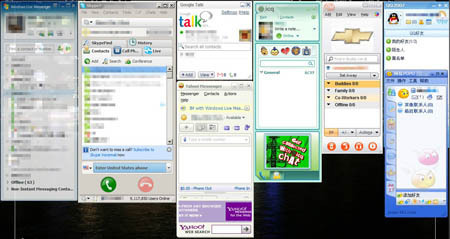 And, when I stopped using MSN Messenger a while back, there were a few friends who I just stopped being in touch with, until I logged back on, because that's how we used to communicate. Thing is, all these channels, loosely, enable the same thing - communication, admittedly in different ways. But some people are much more comfortable with some than others, even though all will reach me. Which, perhaps, is something that applies to our brands that are acting like people. Brands can reach an audience in innumerable ways. But perhaps some of them are more comfortable for the audience in question than others. And maybe some brands just wouldn't use Facebook to get in touch, because it's not who they are and never will be. Just like my dad doesn't. Is it just me or is this arrow moving in the wrong direction? I found it oddly jarring, so I took a long photo. I like how flickr have taken clip culture and pulled it into their own territory: photography. Matt has a good post about introducing a function that automatically loops the long photos, turning a micro narrative into a recursive system, which makes complete sense to me - as soon as I took the long photo I instinctively wanted to loop it - repeating patterns endlessly repeating appeals. Coincidentally, he also links to this burgeoning collection of 11 second shots. Red Brick Road's new website defines the agency in contradistinction to the rest of the industry, which is fairly standard for new model agencies - the agency is called Red Brick Road because it's the path that Dorothy didn't take, the path less travelled so to speak. But their Yellow Brick Road satirical site sends up the industry and made me laugh on a sweaty Friday afternoon. 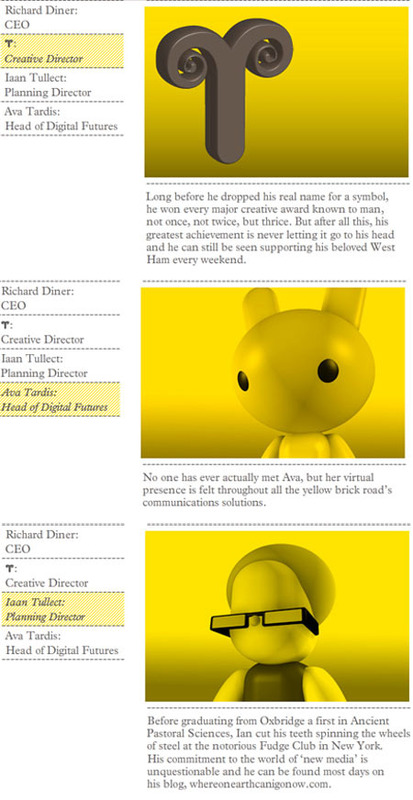 I like the typologies of agency folk above but, to clarify, I don't DJ anymore, especially not at the Fudge Club. Defining yourself by what you are not can be a defensive positioning, especially for a challenger brand so clearly linked to the establishment it's poking fun at, but this is pretty charming on the whole. 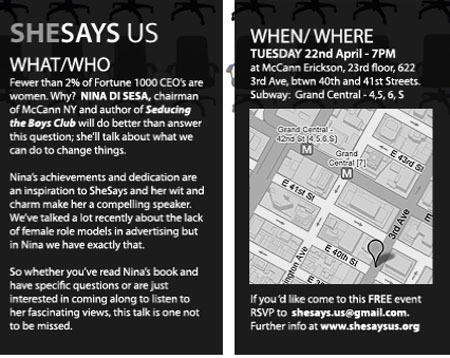 My mate Alessandra is starting monthly events in New York for women in the advertising industry, starting next Tuesday, under the banner She Says. Apparently I'm not allowed to go. My mate Chris made this - the suicide cult finale to the Creme Egg season. There's an alternative, more somber, version as well. I'm always staggered by the amount of patience and skill this sort of work takes - endless hours to get seconds. The gooey money shot is worth it though. I love how Creme Eggs are only sold between January 1st and Easter - relative scarcity makes them taste better.